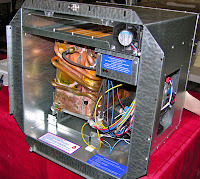 Phil, I’ve seen the Girard unit at the National RVIA Trade Show, but I’ve never installed one or had it tested. I haven't seen any reviews about it either. It’s relatively new on the market. The Precision Temp RV 500, on the other hand, has been around for a few years and I’ve personally installed and tested one. Though I didn't take a shower, (it was a customer's rig, after all! ), it worked perfectly during testing after the installation. Click here to read my full review of the RV 500.